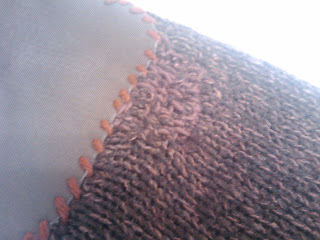 So the other day I came across this article (http://blog.craftzine.com/archive/2009/03/darn_it.html) on craft magazines blog about darning. I had never done it before and always wanted to know how. So I read though the how to and then coincidentally the next day a co-worked asked if I knew how to darn! Her sweater had a big hole in the elbow. I said "Of course I do!" but of course i had only read how to do it. 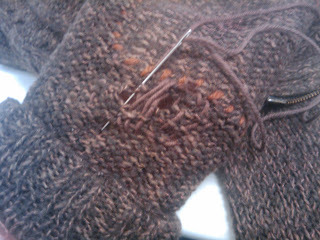 So I gave it a shot and she bought some brown yarn and I got to work. It was so fun and easy! And it turned out Perfect! From afar you cant even tell there was ever a hole. I cant wait to do it again! Now you can be darning your socks in the night when there's nobody home! I've always wanted to do that!